Founded in the 7th Century, Dubrovnik has been attracting visitors for centuries, principally to its UNESCO World Heritage Old Town. Justifiably named ‘the jewel of the Adriatic’ by George Bernard Shaw, Dubrovnik is packed with ornate buildings interspersed with narrow step lined passages, all encompassed by impossibly engineered 16th Century walls rising steeply from the shimmering Adriatic. With so much to see and do, how should you best spend one day in Dubrovnik? Tourism to Dubrovnik has grown to overwhelming proportions with 2018 witnessing the introduction of measures to stagger visitor numbers. This is despite the historic city being one of the most expensive places to visit in Croatia. The Old Town is the most visited location in the city and can get very crowded particularly in summer months or when a goliath cruise ship visits. Check the cruise ship timetable before you visit and try to schedule your sightseeing on a day with few or no cruise ship visitors. With only one day in Dubrovnik, whenever you visit, try to start your day as early as you can. Temperatures will be lower and the main sights will be quieter. With all the stone and little natrual shade, the old town gets very hot. Bring plenty of water and sunscreen. Dubrovnik hosts many world class museums but in a one day visit, you will have to prioritise what is most important to you and what is quintessentially Dubrovnik. Dubrovnik – a photographers dream! Plan your day in order to group your sightseeing by locations, opening times etc to save you criss crossing the city. Try to minimise using public transport or driving as traffic is always heavy. Large crowds will also slow you down. In the hot summer months, be realistic about what you may achieve in high temperatures; you may have a more enjoyable time seeing less and moving slowly than rushing around trying to pack everything in. Prioritise your day and see how far you get on your list! 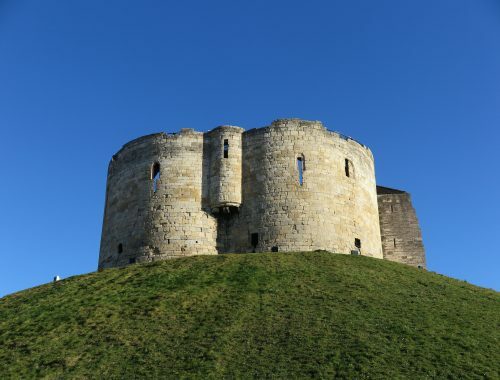 With only one day to spend in this historic city, the iconic city walls should be a priority. Start your day early, ideally arrive for opening time (8 am in summer, 9 am in winter). The walls are the most popular tourist site and the narrow walkways get clogged with visitors. In summer, the reflected heat from the stone adds to already high temperatures. Unbearable heat and shuffling crowds will affect your enjoyment so plan accordingly! The 2 kilometre walls take around two hours to complete at a very leisurely pace and for a relatively short attraction, entrance fees are steep. In 2018 tickets cost 200 HRK for adults, students and children over 5 are 50 HRK and children under 5 are free. Tickets also include entrance to the Lovrijenac Fortress and the ticket money goes towards the upkeep of the walls. Unfortunately, unlike many other attractions, there is no family entrance ticket; in 2018 our family of five we paid a whopping 450 kuna. Perhaps this is the reason we saw no other families walking the walls! Despite the steep entrance fees – and despite the fact we live in a walled city – I still think the walls are worth visiting especially if you are lucky enough to visit on a quiet day. Originally built in the 10th Century, fortified in the 15th Century, the complete, continuous walls encircle the old town offering unrivalled views of the myriad of terracotta roofs and church towers. The impressive, well-preserved walls vary in thickness from 4 to 6 metres. Walk along the top of St Johns Fortress and admire the Old Harbour. Climb the narrow steps to Minceta fortress – the highest point of the walls – for unrivalled views of the old town. 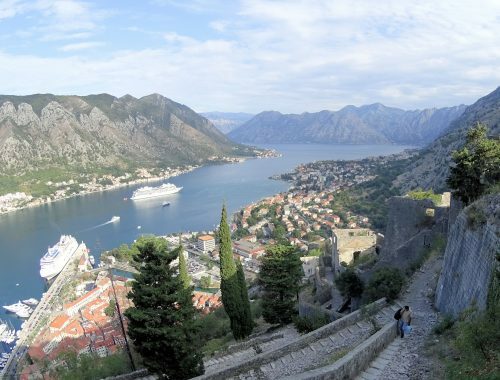 The Minceta Fortress – the view is worth the extra steps! 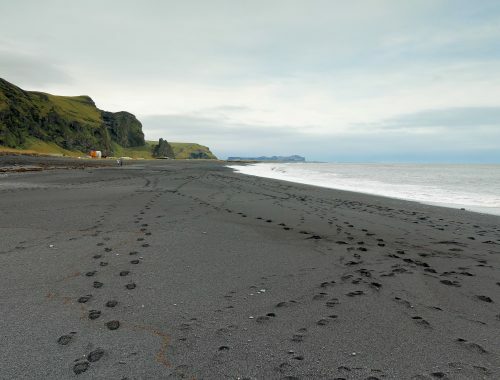 Every step brings scenic viewpoints and new angles. Buildings of all shapes and sizes with vivid terracotta roof tiles slot together in tiny spaces like a momentous game of Tetris. The mountain side of the walls give you expansive views over the crammed city; our children enjoyed spotted precariously hung washing lines, unusual chimneys and pretty balconies. They were particularly impressed with an elevated basketball court. The Adriatic side of the walls provides a blissful breeze and the chance to get postcard perfect shots of the medieval walls falling away into the sparkling sea. Beware that there are steps and ridges along the path and with the stunning views it is easy to forget to look at your feet; we saw several tourists suffer falls. Don’t rush, step back, find some shade and soak up the view. A cooling breeze at last! Credit is due to the people of Dubrovnik for the painstaking and extensive rebuilding of their beloved old town and walls after the devastating siege of Dubrovnik during the Balkan Conflicts of the early’90s. During the seven month siege over 55% of the buildings in the old town were damaged, many beyond repair. The medieval walls sustained 111 direct shell hits. 43 civilian residents lost their lives. The only outward evidence we witnessed were the newer terracotta roofs with velux windows. Descending from the walls, spend a couple of hours wandering the maze of pretty pedestrianised streets of the Old Town. Walk through the Ploce Gate and view the 16th Century, Renaissance Sponza Palace – one of the few buildings in Dubrovnik to have survived the destructive 1667 earthquake – and the Gothic Rectors Palace, now the Cultural History Museum. As we found out during an impromptu picnic, this is a popular venue for posed wedding photos! Savour the cool interior and silence of the baroque Church of St Blaise, dedicated to the citys’ patron saint before ambling down the shiny Stradun, the immaculate limestone paved ‘main’ street leading to the Pile Gate on the other side of town. If budget is no hindrance, this is the place to dine, to see and be seen. Explore the impossibly narrow alleyways leading off the Stradun, climbing up in endless steps towards the city walls. Marvel at the mix of overhanging balconies, tangles of wires, lines heaving with washing and fragrant flowers. Be sure to visit the smaller, quieter side streets in the heart of the Old Town, full of quirky shops and boutiques. Here is where you will find cheaper options for eating with assorted bakeries offering pizza slices, pre-made sandwiches and cakes. Some cafes and restaurants we visited would not serve us drinks without food and prices are high. Inevitably, this means you may end up using one of Dubrovniks’ extortionate public toilets (10 kuna per person!). There is one very close to the toilet inducing and very pretty 15th century Onofrio Fountain, a very popular spot on a hot summers day. Just outside the Pile Gate, is the impressive Fort Lovrijenac, built on top of a 37 metre high cliff. If you have any energy left in your legs, the climbing to the top will give you spectacular views of the old town. One of the biggest tourist attractions outside the city walls is the cable car that makes the three minute ascent to the 412 metre summit of Mount Srd. Although the trip is short and the cost is high (150 kuna per adult, 60 kuna for children) the views from the top are magnificent. If you need a break from the hustle and bustle of the city, take a boat trip to Lokrum Island. Just ten minutes by boat from the Old Town harbour you do not need to join an organised tour for this as taxi boats regularly make the trip throughout the day. Escape the crowds, enjoy the cool breeze during the short boat ride and spend some time wandering around this very pretty island. Even if you do not spend much time on Lokrum, the trip is worth the boat ride alone as the impressive feat of engineering that is the Old Town walls can only be fully appreciated from the sea. After a long day sightseeing, cool off with a visit Banje beach, a sandy stretch of beach ten minutes walk east of the Old Town. This popular spot gets very busy in summer! Is it worth buying the Dubrovnik Card? The answer depends on how long your visit is and what you want to see in that time. For a family, it also depends on how many children you have and how old they are. The Dubrovnik Card includes entry to the city walls, numerous museums, free city bus travel and discounts for suburban bus travel, other museums and some restaurants and cafes. The cards are available for one day, three days or seven days and what is included varies depending on the duration of the card so check carefully what is included before you purchase your card. There is usually a discount offer for buying the card in advance online. Be aware that one day means one day, not 24 hours, so your visits cannot be split over two days which is an option that usually appeals to families. The Card includes the city walls and principal museums such as the Cultural Historical Museum and the Natural History museum. In your one day in Dubrovnik you are intending to visit the city walls plus a couple of museums then the card will be worth it though that will be most of your precious one day used up. However, a busy sightseeing day like this is challenging with children. Families also need to bear in mind that the card does not include entry costs for anyone over seven years old so if you are planning on cramming a number of museums into your day to make your adult card worth buying, remember that you will have to pay for each attraction for any child over seven. And any child under seven is unlikely to want to visit several attractions in one day! If you are only planning on visiting the city walls, the card is not worth buying. It is a shame there is no family card option or that the card cannot be used over 24 hours; it would make it much more appealing to families. Due to the high accommodation costs in Dubrovnik, we decided to stay further along the coast in small, quiet Cavtat and make a day trip to Dubrovnik. Even with the added transport costs, we saved a lot of money by staying outside of Dubrovnik and after visiting Dubrovnik on a very busy day, we were glad we decided to stay somewhere quieter! You can read why we fell in love with gorgeous Cavtat here. Dubrovnik is easily accessed by road or by boat from other locations along the coast or from the islands (for example, Cavtat is 45 minutes, Korcula is 2 hours) it may be as easy to stay further away from the city and visit Dubrovnik as a day trip. It will certainly be cheaper. Travelling by boat is ideal as you will not get stuck in city traffic and timetables start early and run late into the night. Not only do the boats drop you right outside the entrance to the old town (avoiding having to find parking or a walk from the bus station) but the approach by boat is breathtaking. The sheer city walls appear to rise out of the sea bed itself. If you choose to stay Dubrovnik, try to stay within the Old Town. Wandering around the atmospheric streets before and after the crowds is a joy. The main sights are easily accessible on foot and you can pack a lot of attractions into your stay. The downside will be the cost. 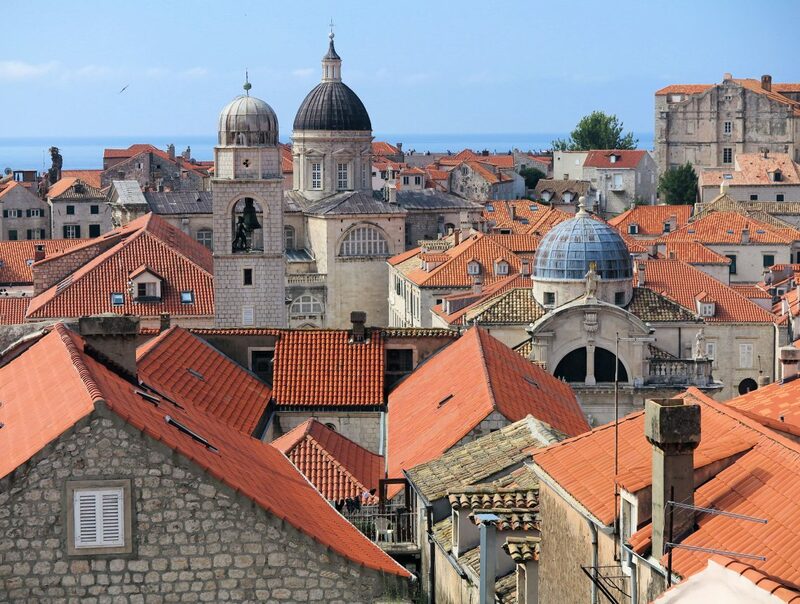 Check out these Dubrovnik accommodation recommendations from Our Escape Clause. Alternatively, stay as close as you can to the Old Town but bear in mind that traffic is always heavy and as most of the sights you will want to see are in the Old Town, you do not want to waste your time travelling by bus or car. Eating out is expensive so consider self-catering particularly if visiting Dubrovnik with children. One day in Dubrovnik is not enough to see and savour all the city has to offer and like us, you will leave already planning how and when you may be able to return!